Lupus anticoagulants (LAs) are antiphospholipid antibodies that interfere with in vitro phospholipid-dependent clotting tests, but are associated in vivo with significant clinical manifestations such as recurrent pregnancy loss and venous and arterial thrombosis. Although their detection is important for the diagnosis of thrombotic disorders such as the antiphospholipid syndrome, laboratory identification has historically been fraught with many issues. 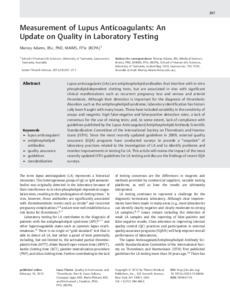 These have included variability in the sensitivity of assays and reagents; high false-negative and false-positive detection rates; a lack of consensus for the use of mixing tests; and, to some extent, lack of compliance with guidelines published by the Lupus Anticoagulant/Antiphospholipid Antibody Scientific Standardization Committee of the International Society on Thrombosis and Haemostasis (ISTH). Since the most recently updated guidelines in 2009, external quality assurance (EQA) programs have conducted surveys to provide a "snapshoto" of laboratory practices related to the investigation of LA and to identify problems and monitor improvements in testing for LA. This article will review the impact of the most recently updated ISTH guidelines for LA testing and discuss the findings of recent EQA surveys.